We were in our last couple nights of evangelism meetings when a water pipe burst, flooding a room behind the sanctuary, near the baptistry entrance. One of the deacons told a local elder to help the other deacons pump the water out. The elder politely replied that he could not do that, because he had to visit with the baptismal candidates to clear them for the baptisms coming up. The deacon then accused the elder of being on an ego trip, thinking he was too good to do manual labor. But that was not the case at all. As an elder he had a job to do in getting people ready for the baptism, and could not do both at the same time. The early church ran into a similar problem where certain necessary duties were keeping them from preaching and teaching. Hence the office of deacons came into the church. Like the elders, the deacons were to be men full of the Holy Spirit. They are not less than elders, but their duties are not the same. Yes, Steven preached in Acts 7 and Philip baptized in Acts 8. Every office in the church carries the equal responsibility of sharing the gospel. But deacons and deaconesses are also given responsibilities of caring for the physical upkeep and maintenance of the church, and even caring for the physical needs of the members. This frees the elders from “waiting on tables” so they can be spreading the gospel. That evening that the water pipe burst, the deacon told the elder that a real leader should never ask anyone to do a job he would not be willing to do himself. He then handed him a bucket insinuating that he should get to work and show a little humility and lead by example. There was only one problem. The elder had appointments with several candidates for the baptisms the next couple nights. They were waiting for him right then, and they worked the next day before the baptisms the following nights. It wasn’t that the elder thought he was important. It wasn’t even necessarily that he thought clearing people for baptism was more important than fixing a water break. Obviously the water break had to be fixed to have the baptisms! Both the deacon’s job and elder’s job were equally important but not the same. In 1 Corinthians 12 Paul talks about different gifts and ministries in the church. He talks about how the foot and hand are both needed. However while the foot is equal to the hand, the foot is still not the hand. While being equal they are not the same. Each has their own distinct purpose. Deacons are to be filled with the Holy Spirit and able to preach. And elders have gladly taken up the offering and locked up the church after a meeting, taken out the trash, so long as they can still accomplish their gospel responsibilities. 1 Corinthians 12 tells us one ministry is not superior to another, while Acts 6 tells us our offices are not the same. When Was The Last Time You Invited Someone Home From Church? When was the last time you had people from your church over to your house? The New Testament speaks of churches in homes. See Romans 16:5, 1 Corinthians 16:9, Colossians 4:15,Philemon 1:2. Years ago, when I became a Bible Worker at a church in Texas, an elderly saint informed me of a group of people who began having church in one of their houses. She wanted me to get them to come back to the “real” church because, according to her, having church in a house was not “real” church. Realizing that having church in a house was indeed “real church,” I reached out to them and began a wonderful friendship. We worked together and played together, even though they “assembled themselves together” for worship in a house, while the rest of us assembled at the church building. 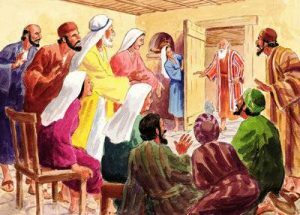 God’s remnant church will look like the original church, and the original church first met in homes as well as meeting in the temple court. Meeting in buildings dedicated to Christian worship came later. By the way, the order of service most Adventists follow for worship service does not come from the New Testament. It comes from the Methodists. Nothing wrong with that. Just saying. Occasionally I have gone to preach in a church building that only had about 15 members present. Instead of having church in the sanctuary “Methodist style” I persuaded them to come into the fellowship hall where we all sat in a big circle and had a “home church.” Instead of preaching a sermon I led out in a group Bible study. It was informal yet reverent and Bible-based. Many told me they found it refreshing. It was what I imagine church to have been like in the New Testament. Notice even the churches that met in temple courts also met in homes. To me, the fact that they met in each others’ homes shows me how dedicated they were to the church. They took the church home with them! The New Testament church was not compartmentalized. There were no boundaries between what belonged to the church and what belonged to them. Their home dining room was just as much church property as the fellowship hall. Do we compartmentalize today? For example, let’s look at church fellowship lunches. Are they social or anti-social? For instance, do we meet for lunch at church so we don’t have to actually invite each other over to our house? We say we all meet at church so we can all socialize together. Really? Then tell me why when I visit various churches I see so many people eating alone at fellowship lunch. I often see families sitting alone at tables that could have just as easily been sitting alone at home. But it makes us feel more sociable if we eat alone at church? Of course many people do actually fellowship during fellowship lunches. Still, I have to wonder why we aren’t meeting in homes more often? Again do we compartmentalize? Do we fellowship on neutral ground while protecting the privacy of our home? Does our church have borders, or do we hold all things common? The New Testament church did not compartmentalize. They held all things common, even meeting in their homes. I believe the remnant church should reflect the New Testament church. In the last days Satan is working hard to polarize us and make us unsociable. Meanwhile God is drawing us together to make up, not an isolated people but a great multitude which no man can number, who reflect His character of love and hospitality.